At only 76 pounds, this unit is one of the lightest in its class making it a breeze to roll through the garden. Ideal for residential clean up, it costs little more than a backpack, but is 2.5 times more powerful so you’ll get your work done faster with less fatigue. The patent pending FORCE by Billy Goat offers the best of both worlds – unmatched blowing power and the lightest weight of any leading blower. Conceived through market research and hours of exhaustive computer optimization, the FORCE blower represents a truly revolutionary design. 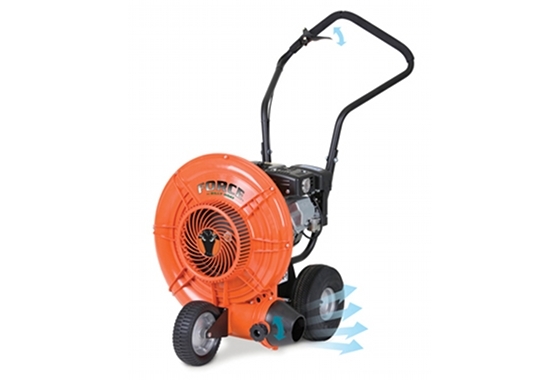 The FORCE weighs up to 17 pounds less than comparably powered steel competitors, it remains the quietest wheel blower, and it is tuned to produce unmatched blowing power. Stonger Than Steel: The no rust, no dent volute housing is quiet, light and designed for maximum output, long life and productivity. Powerful 15/16 Blade Fan: Computer designed for optimum performance, less weight, low noise, no rust and less stress on the engine shaft. Aim & Shoot Nozzle: The patented swivelling nozzle directs hurricane force winds where you need them most, with fingertip control and is lockable in three positions.